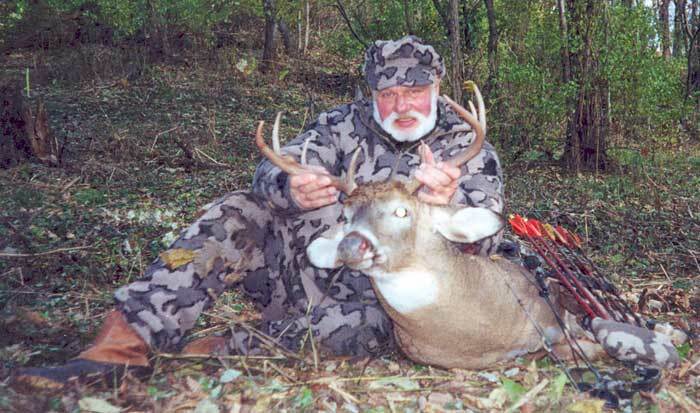 It’s no secret that the Master bowhunter, Bob Fratzke was involved with hunting ever since he was a young boy.Bowhunting’s Whitetail Master’s by Dan Bertalan documents Bob’s early years in hunting and how at age 17 he captured the local archery club championship in his first year of bowhunting. 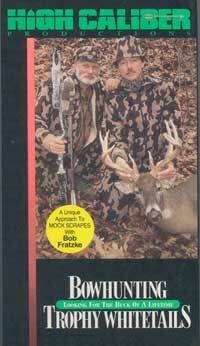 “Bowhunting’s Whitetail Master’s” was written in 1992. 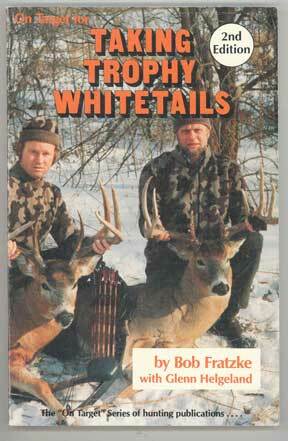 This very informative book shared more stories of Bob Fratzke’s Whitetail hunting experiences and included hunting tips about how Bob managed to get those trophy Whitetails. Bob Fratzke is still hunting today and his enthusiasm over bowhunting is still as strong as ever. The area around his home town of Winona, Mn still offers those trophy Whitetail deer which Bob doesn’t seem to have any trouble finding. Anyone who is interested in bowhunting would love to read the bowhunting tips in Bowhunting’s Whitetail Master’sand in the book that Bob Fratzke wrote Taking Trophy Whitetails in 1983. An updated 2nd edition was written in 1992. Bob’s book went into depth about techniques and hunting tips that he used in bowhunting these trophy whitetails which contributed to him becoming known as a Master bowhunter. These bowhunting tips and techniques are still applicable today. photos below left to right: 1. 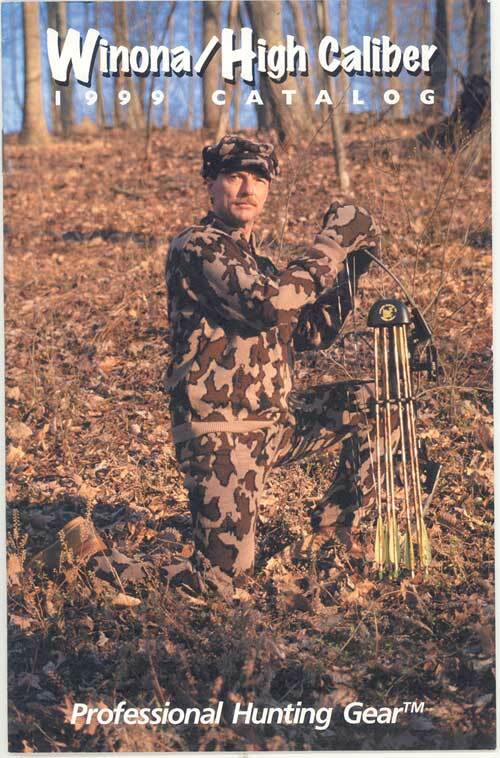 Bob Fratzke on a bowhunting trip in Mn in 1986, wearing Winona Camo and a Winona Floppy Cap 2. 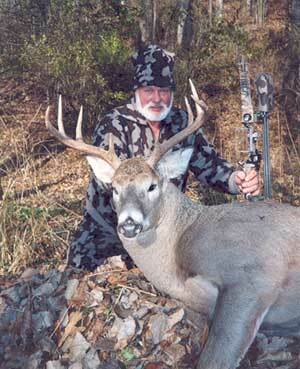 Bob Fratzke with his Whitetail, Wearing Winona Camo and Winona Survivor Cap 3. 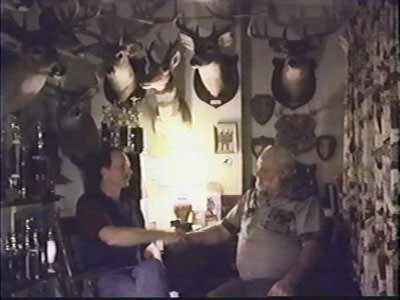 Bill Ware and Bob Fratzke saying goodbye in Bob’s Trophy room after the bowhunting adventure in 1992 and the filming of the VHS tape: Bowhunting Trophy Whitetails, produced and edited by Bill Ware and High Caliber Productions. Bob Fratzke was also known as “Camo Man” for good reason. Bob was the originator of the famous knit Winona Camo© hunting clothes and accessories which also was referred to as “Fratzke Wear”. This is the history of how Winona Camo© began and evolved as related to me by Bob Fratzke. , Bob also graciously sent me copies of his book, Taking Trophy Whitetails and some articles to aid me in the research on the history of Winona Camo System™ – Professional Camouflage. Bob Fratzke started working for Winona Knitting Mills, Inc. in Winona, Minnesota right out of high school in 1958. He held several different positions at the Knitting Mill from knitting mechanic to production designer creating new fabric patterns and designs. Combining Bob’s expertise in bowhunting together with his skills in knit garment manufacturing and designing, it comes to no surprise that in 1975, Bob Fratzke designed the Winona Camo System™. 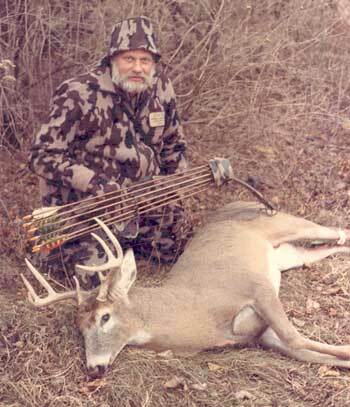 All Bob's experience in bow hunting gave him the insight to know exactly what was needed for camouflage clothing that would excel for hunting the trophy whitetails that he was seeking. 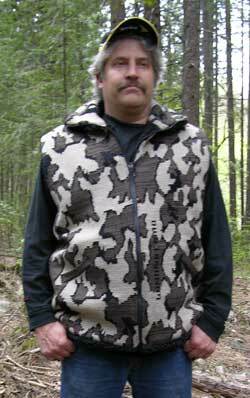 With his knowledge of knit design, Bob Fratzke knew he could design a camouflage system that would aid in his hunting experiences. KNIT JACQUARD FABRIC – each stitch is individual so if a hunter snagged the fabric on barbed wire or a twig in the woods, only one or two stitches would tear, therefore the fabric would not run (unravel) and would be easy to fix. SIZE OF THE PATTERN – Bob says, “Most camo patterns are too small, they look good close up, but from a distance, look like a blob”. Bob knew at that time, the existing camouflage clothing didn’t provide the true woods-blending camouflage needed to break up a hunter’s form in the forest. COLOR CONTRAST – Bob also knew “that to be effective in the field, camo fabric needed a light-toned background with a big, bold pattern”. Bob felt that the key to effective camo is the degree of contrast between light tones and dark tones. Black is very important because it gives you the dark extreme. Contrasted with light tan, light grey, or light green would give the right effect. He liked the balance of 50% light / 50% dark in the color tones. GARMENT STYLE – Bob commented that all his hats had to have soft brims, big enough to shade the sun out, but small enough not to block out your vision when you draw your bow string, and SOFT so it would bend if you hit the brim when drawing back your bow string. 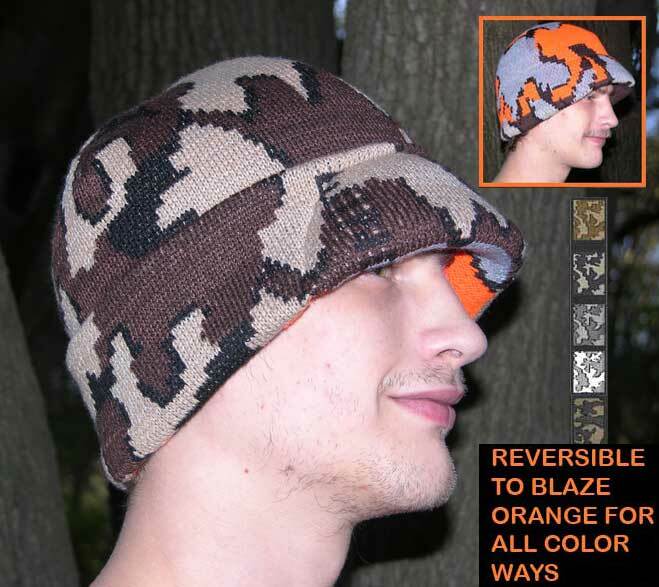 See the Ridgerunner, Survivor, and Floppy Camo hats that Bob Fratzke originated. GARMENT WARMTH – Bob knew it was important not to get overheated, but it was also important to keep warm, especially your neck and kidneys, in cold weather hunting. Layering was very important. Both Acrylic yarn in his Classic Camo© and a blend of acrylic and wool in his Elite Camo© were offered to cover the different degrees of warmth needed. Bob commented that he liked to wear knit camo Vests for layering, a knit camo facemask with just his eyes out in cold weather hunting, and he preferred the mittens with a palm slit over gloves, because it was easier to keep the hand warm in mittens. He said you had to be able to tuck in or close the pant legs to help keep the scents contained. See the article about the reconstruction of the Knit Camo Winona fabric by Sharon Nani, owner of The Knit Tree, under a license agreement derived from copyrights originated by Bob Fratzke. To sum it up Bob Fratzke said, “Our garments lead the way in totally quiet camo clothing. 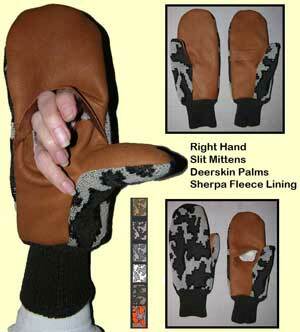 They breathe, stretch, hold up well, are washable, and are comfortably warm. And one of the best parts of making quality camo garments is getting to know a lot of good people in bowhunting today. 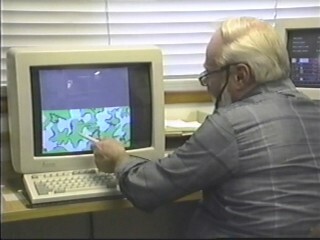 above left to right: Bob Fratzke designs the camo pattern on a computer. 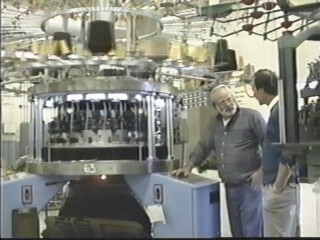 The disc is inserted into a floppy drive which sends the knitting information to the circular knitting machine to the right and then the last photo shows a finished piece of the knit Winona camouflage fabric. 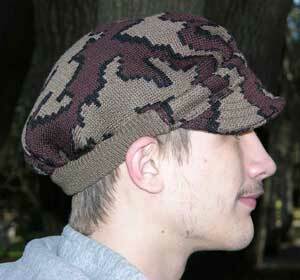 This fabric is then used to construct a variety of knit camouflage clothes and accessories. photos above were taken from the VHS tape Bowhunting Trophy Whitetails filmed in 1992, with the permission of producer / editor Bill Ware of High Caliber Productions. The evolution of knitting equipment has speeded the production capabilities. In the later days of Winona Knitting Mill, computerized equipment was added. These machines cost around $180,000. each, but could produce the fabric for several garments in one hour. Bob said that Winona had mills at 2 locations and employed over 800 people at one time. 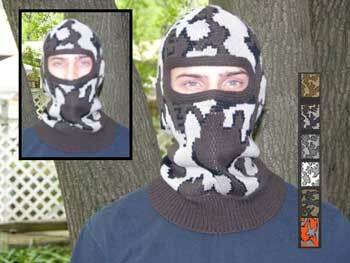 They were the largest knitwear manufacturer in the US, knitting a large variety of knitwear items (not just camo). In 2000, Winona Knitting Mills, Inc. announced that they would be closing their plants citing international free trade agreements that priced the Minnesota sweater –making industry out of business as the reason for the plant’s closing. Products once made by the plant would be produced abroad. Bob Fratkze filed a copyright for the first Winona Camo Pattern called “Winona Brown Camo” citing date of creation 1975. Notice that this original Winona Camo graphic pattern did not have the black outlines around the brown spots like the later, 1996 Winona Camo Classic© and Winona Camo Elite© graphic patterns. Photo above is a Winona Camo© cardi jacket in Winona Brown Camo©. This jacket was purchased in the 1980's by Grainger Hunt. See the article about the reconstruction of the Knit Camo Winona cardi jacket in 2011 by Sharon Nani owner of The Knit Tree under a license agreement derived from copyrights originated by Bob Fratzke. In 1992, Bill Ware and his team from High Caliber Productions joined Bob Fratzke in Winona, Minnesota “Looking For the Buck of a Lifetime” and to document the bowhunting adventure on a VHS Tape. This trip proved successful in the hunt and in a friendship which emerged between Bill Ware and Bob Fratzke from the shared adventure and enthusiasm for bowhunting. The VHS tape to the right shows Bob and Bill on the cover with one of their Trophy Whitetails from the 1992 hunting trip near Winona, Mn. 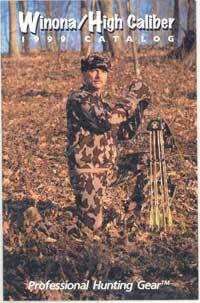 In 1996, Bob Fratzke and Bill Ware joined hands to form Winona Camo System&trade;, Inc.. and to promote the sale of Winona Camo Classic© and Winona Camo Elite© knit camouflage hunting clothes and accessories. The new 2nd generation Winona Camouflage pattern used in Winona Camo Classic© and Winona Camo Elite© was also originated by Bob Fratzke. 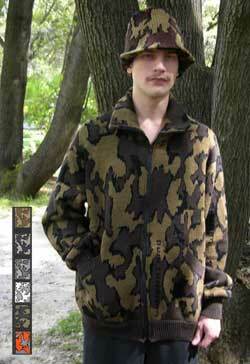 Bob felt it was an improvement over the Original Winona Brown Camo© that he origininated in 1975. Bob Fratzke changed the camo graphic to add black outlines around the forms to better break up the silhouette. The Classic Winona Camo© and Elite Winona Camo© both use the new and improved Winona Camo graphic pattern. Classic Winona Camo© was offered in 100% Acrylic and Elite Winona Camo© was offered as a blend of a of acrylic and wool, the combination of wool and acrylic gave a more grey dimensional heather look to the same bark tan / black / fall brown color way. Copyrights for both Classic Winona Camo© and Elite Winona Camo© were filed. 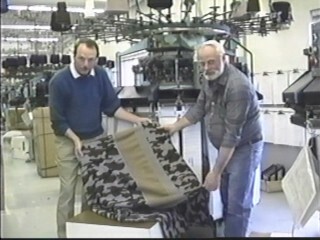 Bill Ware and Bob Fratzke promoted the sale of Winona Camo© knits through a catalog and a web site from 1996 thru 1999. Their last catalog was published in 1999. 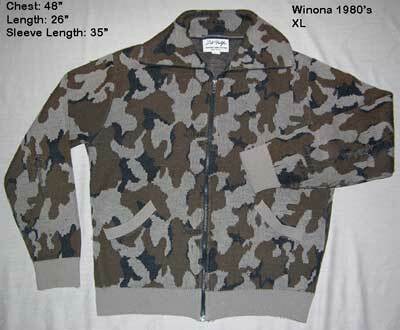 The catalog offered the knit Winona Camo© garments and accessories in both Winona Camo Classic© and Winona Camo Elite©, along with VHS tapes and related hunting items. Color ways offered were the original bark tan / black / fall brown, snow camo in white / black / grey and blaze camo in blaze orange/ black / bark tan. 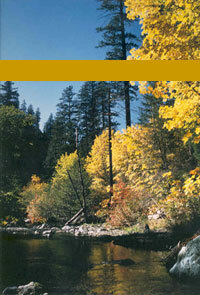 Click here to open a pdf file of the 1999 Winona / High Caliber catalog. It only shows the pages associated with the Winona knit items. pp 1-10 All pictures, product descriptions, and prices reflect what was available in 1999 and are for historic reference only. Thank you to Bob Fratzke and Bill Ware for sharing this historical information and photos. For the last 10 years, Winona knits have been highly sought after in the used market. Hunters often search ebay for these treasured knits. They don’t have to search for used garments any longer. The Knit Tree is honored and pleased to announce that in March of 2011, The Knit Tree was issued the license to Use the famous Winona Camo© Graphic Pattern and to recreate the Winona Camouflage clothing and accessories. The Knit Tree retired the smaller camouflage pattern, shadow maze, that Sharon Nani had handloomed since 2006 and substituted it with the bigger, more effective and open Winona Camo Classic©, Winona Camo Elite©, Winona Camo Snow© and Winona Camo Blaze©, all originated by Bob Fratzke. Sharon Nani, owner of The Knit Tree has been working closely with Bob Fratzke and Bill Ware in the recreation of the Winona knit Camouflage garments and accessories. Bob and Bill sent Sharon an original Winona sample of everything in their last catalog of 1999 along with a huge piece of the knit fabric itself so she could reconstruct the knit graphic exactly as it was in size and pattern. The sewing patterns were lost with the closing of the Winona knitting mills, so all garments had to be reconstructed from the original samples. The reconstruction process has been completed and you will find all the Winona Camouflage Knits which were offered in the 1999 Winona High Caliber catalog now offered in The Knit Tree’s online catalog. Sharon was asked if she was still going to offer all the custom color choices and custom camo clothing previously offered. And the answer is YES. But all the camo items will have the Winona Classic or Elite Graphic pattern on them. The only item that was not duplicated was the Winona Camo pants and camouflage gloves. The original Winona camo pants had a cargo side pocket and was knit with a crotch gusset. The gusset method was a production technique used to knit the leg extensions as a gusset so the pant yardage could be at a narrower yardage. The gusset method also gave an easy method for grading the sizes. The Knit Tree already offered knit Camo Cargo and camouflage Sweat Pants that have proven to be popular body styles and the pant legs were knit with traditional one piece legs. Since these cargo pants are all custom knit and the various size patterns already drafted, there was no need to duplicate the cargo pants with gusset legs.. The Winona Graphic Pattern is handloomed on the Camo Cargo and Camo Sweat Pants. see photo below. The Knit Tree has been handlooming custom knits since 1973. Sharon Nani always operated as a Cottage Industry concentrating on offering quality knit products to the individual client. These are not mass produced items. Each item is custom knit to color and size. 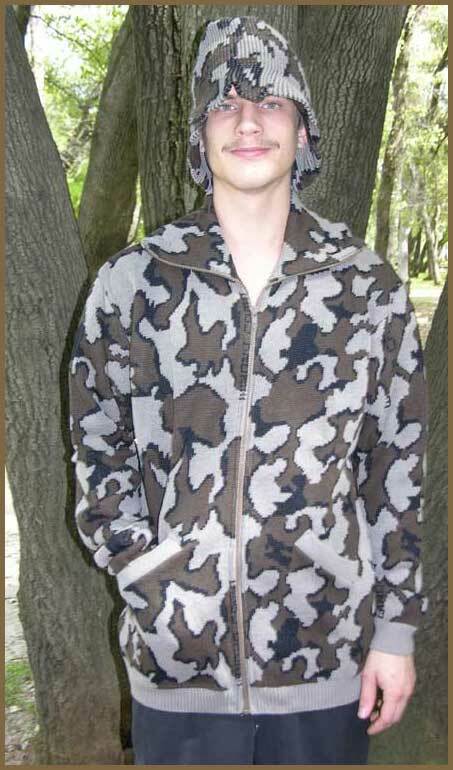 The Winona Camouflage Graphic has been applied to a variety of camouflage jackets, camo sweaters, camo caps, and camo accessories that have proven to be popular knit items throughout the years. The Knit Tree’s Baby Camo Clothes have also been popular throughout the years, so watch for Baby Winona Camo items to appear in the near future! The best thing about all these knits is that they are all “Handloomed in the USA – Redding Ca to be precise”. Bob Fratzke has critiqued and advised Sharon Nani on The Knit Tree Camouflage items and camouflage color ways. and said “I am impressed with the quality of your outstanding workmanship” Read the other comments under our reviews in the online catalog. See our entire line of Camouflage Clothes and Accessories in our online catalog and come back to watch for new designs and accessories. See a small selection of our popular items below which will link into the detailed product description in The Knit Tree Online Catalog. Click here to go to the Camouflage Sweater, Jacket and Vest Category to see the variety of Camo Fatique Sweater, Crew Neck Pullover,Knit Camo lined and unlined vests and jackets. All orders are custom knit so you can get the style and color way that suits your needs. 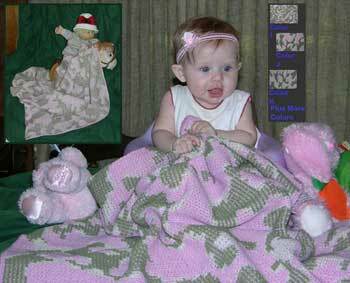 The Knit Tree's Baby Camouflage products have always been popular gift items. 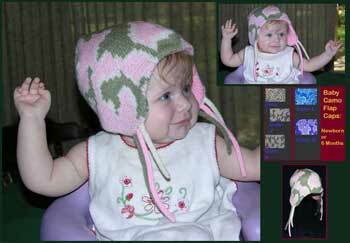 Knit baby camo Cap and booties sets along with the baby blankets are unique baby keepsakes. The camo baby knits have the same Winona Camo graphic on them as the knits for Dad and Mom. 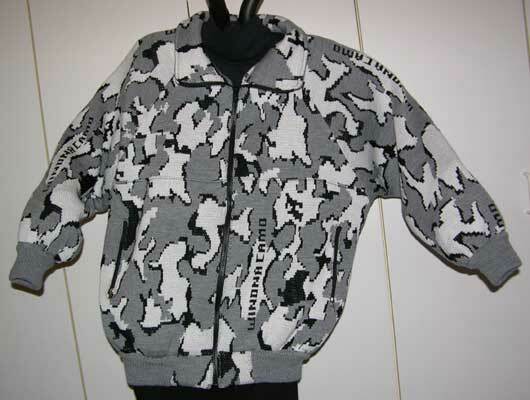 Watch for the little baby hoodies and other camo items to be added in The Knit Tree's online catalog. Click here to go to the Knit Baby Camouflage Category. Also go to our Winona Camouflage & Hunting Photo Gallery to see our Camo Knits being worn in successful hunting experiences.